Graphics Runner blog. Instant Radiosity is a theoretically simple method. It traces paths from the primary light source and creates virtual point lights (VPL) when the path hits the scene. These VPLs approximate the reflected light from that region of the scene. The path can then be reflected, possibly with a new random direction, and is further traced until it intersects the scene again. The decision to further pursue a path can be as simple as russian roulette. The approach in the Graphics Runner blog optimizes this by defining a grid of voxels and merging all the VPLs in each voxel into a single VPL. The scene is then lit with all the computed VPLs. 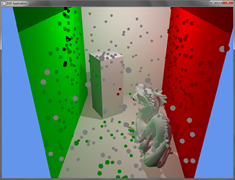 Graphics Runner uses nVidia Optix for Ray Tracing. The article includes a small tutorial and provides some source code.